Download "Multi-layered Security Solutions for VoIP Protection"
2 Multi-layered Security Solutions for VoIP Protection An ISS Whitepaper 1 INTRODUCTION The Benefits of VoIP Voice over Internet Protocol (Voice over IP or VoIP) allows users to make phone calls over the Internet, or any other IP network, using the packet switched network as a transmission medium rather than the traditional circuit transmissions of the Public Switched Telephone Network (PSTN). As the technology has become more reliable in recent years, companies have been moving to VoIP for a number of reasons. Consolidation of voice and data on one network reduces costs and results in a lower network total cost of ownership (TCO). Operating expense savings include lower long distance charges, reduced support costs and savings via workforce virtualization. Companies also use the migration to VoIP as an opportunity to replace aging telephony equipment with feature-rich technology like teleconferencing and collaboration/multimedia applications. VoIP supports increased mobility, since remote workers have the same access to voice features as corporate office employees. Research organization Gartner Inc. recently reported that spending by US companies and public-sector organizations on VoIP systems is on track to grow to $903 million in 2005 (up from the $686 million in 2004). By 2007, Gartner expects 97 percent of new phone systems installed in North America to be VoIP or hybrids 1. Planning and Implementing VoIP Security While it is true that Voice over IP can provide savings over traditional telephony solutions, there are security risks associated with this technology that need to be addressed. Risks include denial of service (), service theft, unauthorized call monitoring, call routing manipulation, identity theft and impersonation, among others. Not only does VoIP inherit all data network security risks, but it introduces new vectors for threats related to the emerging and untested technology and protocols associated with VoIP. These new threat vectors in turn increase the risk to the data network. 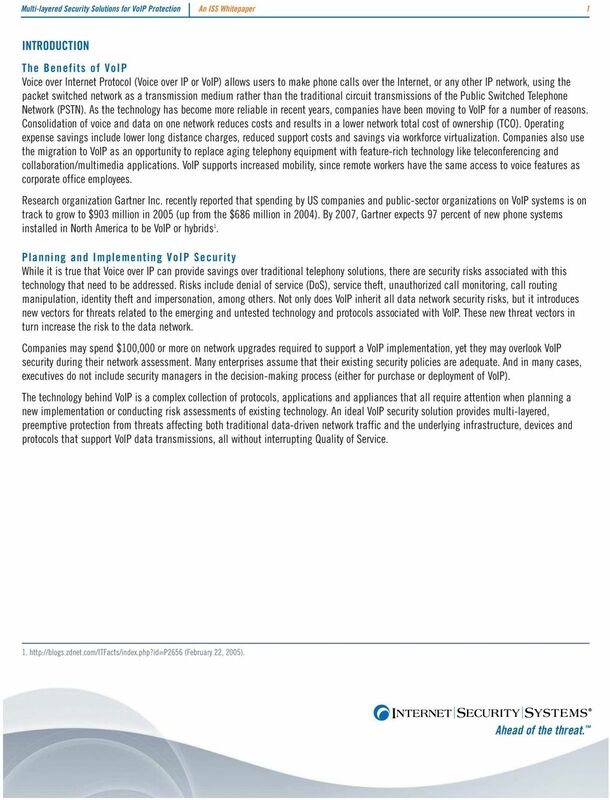 Companies may spend $100,000 or more on network upgrades required to support a VoIP implementation, yet they may overlook VoIP security during their network assessment. Many enterprises assume that their existing security policies are adequate. And in many cases, executives do not include security managers in the decision-making process (either for purchase or deployment of VoIP). The technology behind VoIP is a complex collection of protocols, applications and appliances that all require attention when planning a new implementation or conducting risk assessments of existing technology. An ideal VoIP security solution provides multi-layered, preemptive protection from threats affecting both traditional data-driven network traffic and the underlying infrastructure, devices and protocols that support VoIP data transmissions, all without interrupting Quality of Service (February 22, 2005). 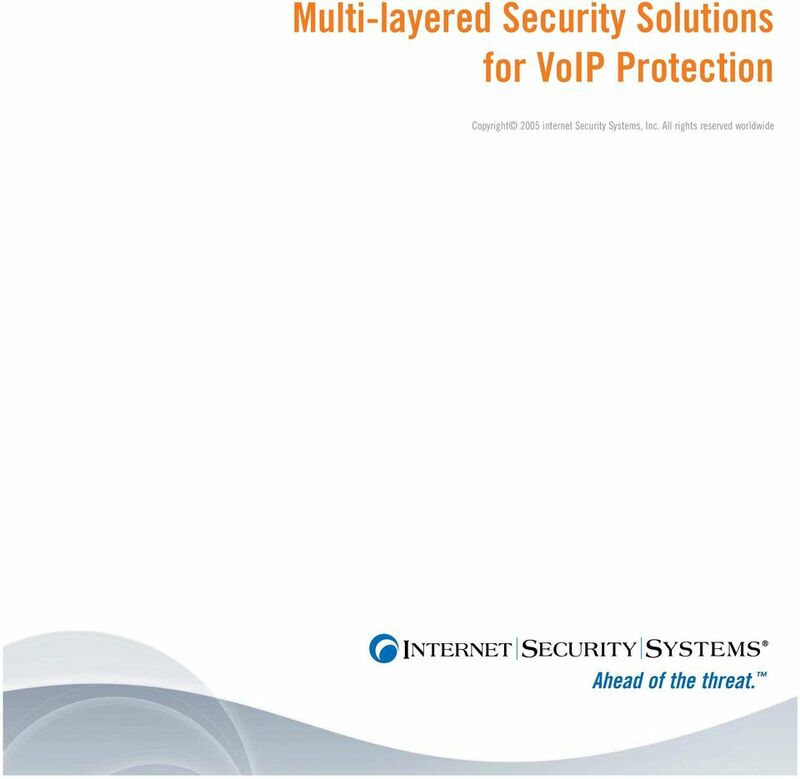 4 Multi-layered Security Solutions for VoIP Protection An ISS Whitepaper 3 SECURITY BEST PRACTICES FOR VOIP PROTECTION Potentially, every component of a VoIP system may be vulnerable. These include the protocols, IP infrastructure (routers, switches), IP/PBXs (private branch exchanges), VoIP-specific servers, and individual phones or soft phones (a PC with a headset). Careful network design and deployment of the VoIP network coupled with the implementation of specific security technologies will ensure quality, reliability and security for VoIP traffic. Protection Technologies While standard network security policies and procedures such as encryption, access control and logical separation of the voice network do provide some protection for VoIP, these measures alone will not provide adequate attack prevention, given the potential for unauthorized access or attacks that easily bypass traditional security mechanisms. Further, protocol-specific vulnerabilities and flaws within the VoIP applications themselves may leave VoIP systems vulnerable to attack in the absence of a vendor-supplied patch. 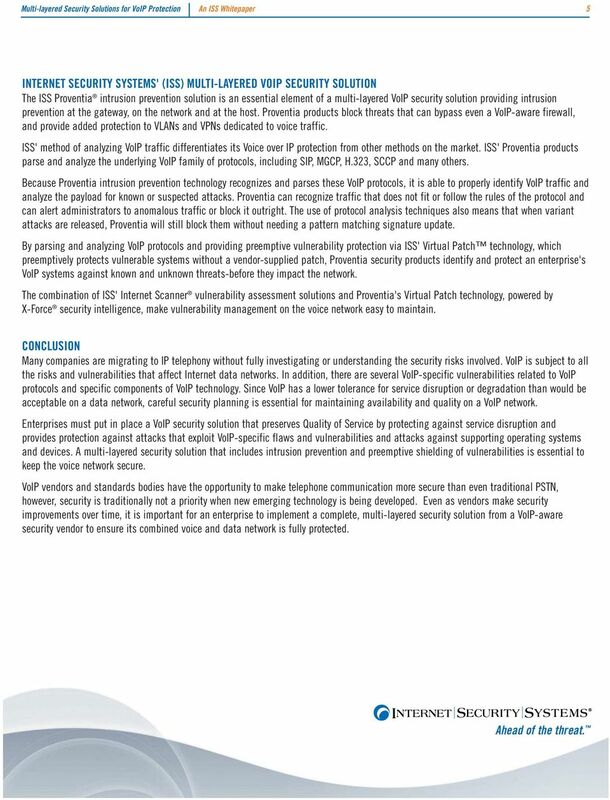 According to a Forrester Research study, It is up to companies to provide the added security measures required for IP [Telephony]: Don't assume that vendors will respond to each and every risk that appears with patches for installed products 3. Encryption for VoIP traffic offers some protection from eavesdropping and other call compromises. But it must be backed up with strong protections not only at the gateway but at the network and host as well. MINIMAL STEPS FOR SECURING VOIP NETWORKS: Separate voice and data on different logical networks (VLANs) Separate DHCP servers Use strong authentication and access control on the voice gateway system Incorporate VoIP-aware application layer gateways (ALGs) and firewalls Use IPsec or SSH for remote management A multi-layered security solution must provide attack prevention for the following: TCP/UDP based attacks, operating system vulnerability attacks, protocol flaws, device configuration flaws and VoIP application flaws. A robust solution should allow for deep packet inspection of the packet payload to recognize known attacks, anomalies or suspected attacks based on known vulnerabilities. 3. 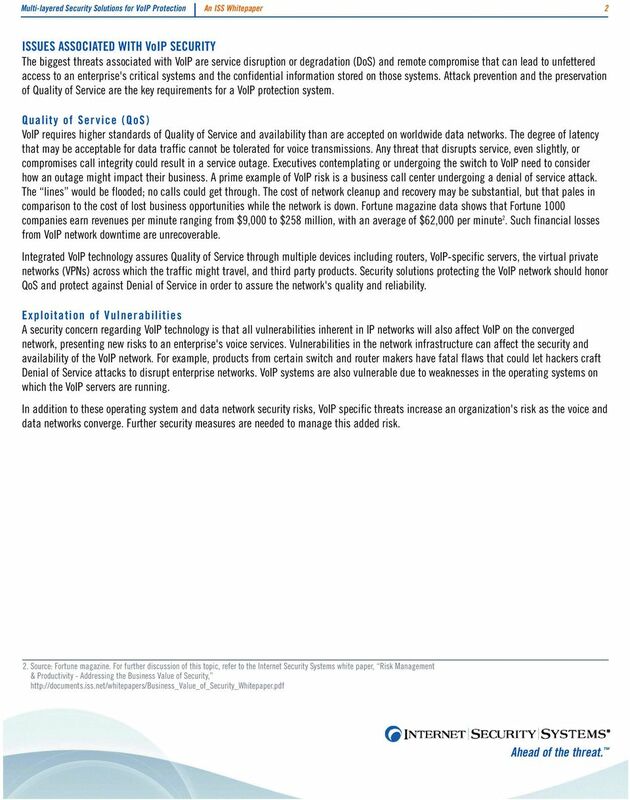 Resolving Security Risks for IP Telephony, by Elizabeth Herrell; Forrester Research, 2004. 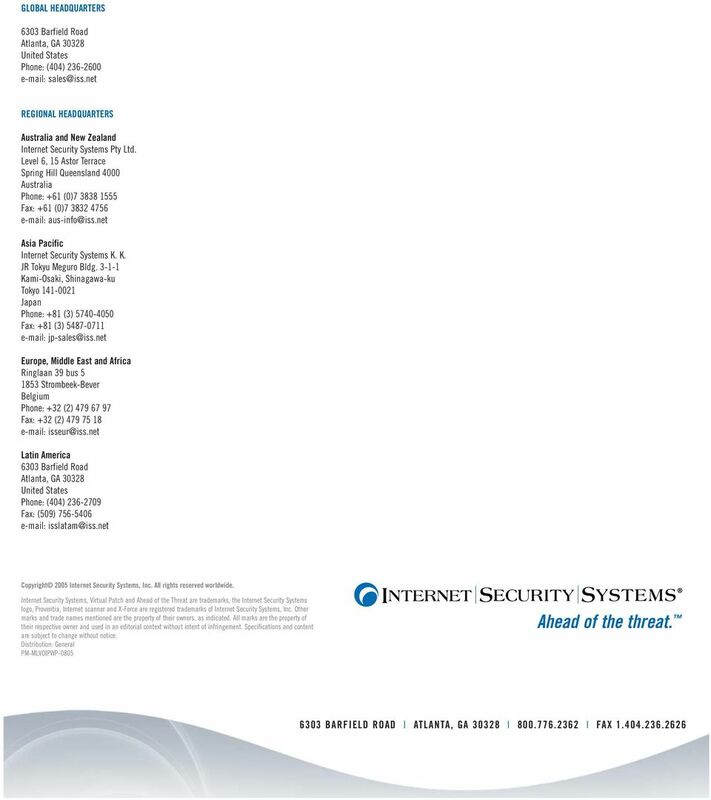 6 Multi-layered Security Solutions for VoIP Protection An ISS Whitepaper 5 INTERNET SECURITY SYSTEMS' (ISS) MULTI-LAYERED VOIP SECURITY SOLUTION The ISS Proventia intrusion prevention solution is an essential element of a multi-layered VoIP security solution providing intrusion prevention at the gateway, on the network and at the host. Proventia products block threats that can bypass even a VoIP-aware firewall, and provide added protection to VLANs and VPNs dedicated to voice traffic. ISS' method of analyzing VoIP traffic differentiates its Voice over IP protection from other methods on the market. 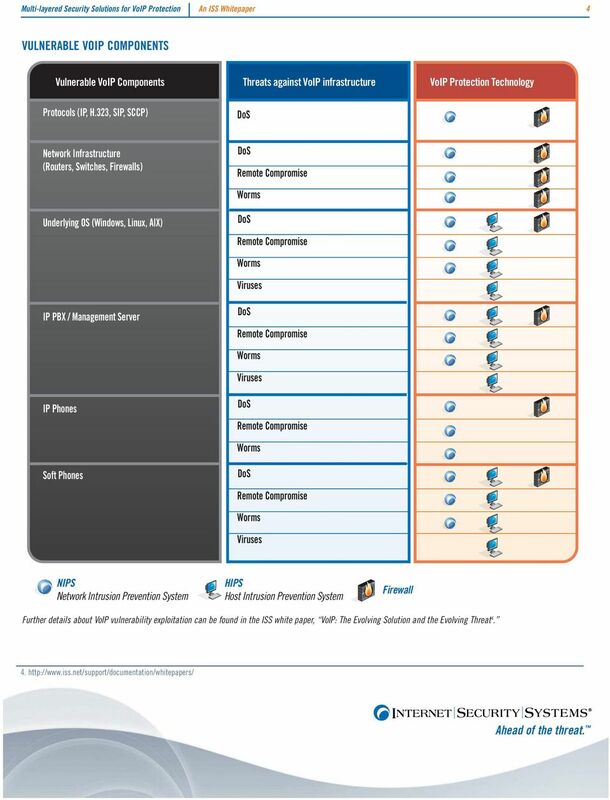 ISS' Proventia products parse and analyze the underlying VoIP family of protocols, including SIP, MGCP, H.323, SCCP and many others. Because Proventia intrusion prevention technology recognizes and parses these VoIP protocols, it is able to properly identify VoIP traffic and analyze the payload for known or suspected attacks. Proventia can recognize traffic that does not fit or follow the rules of the protocol and can alert administrators to anomalous traffic or block it outright. The use of protocol analysis techniques also means that when variant attacks are released, Proventia will still block them without needing a pattern matching signature update. By parsing and analyzing VoIP protocols and providing preemptive vulnerability protection via ISS' Virtual Patch technology, which preemptively protects vulnerable systems without a vendor-supplied patch, Proventia security products identify and protect an enterprise's VoIP systems against known and unknown threats-before they impact the network. 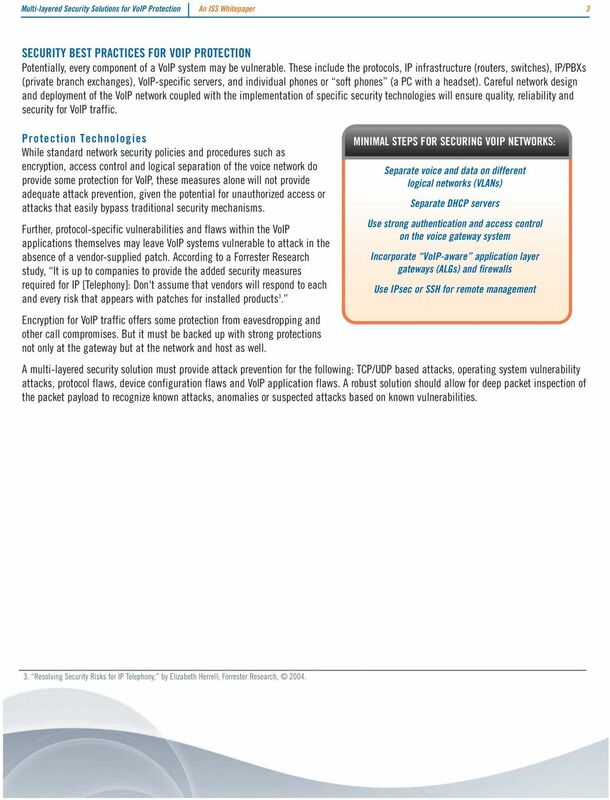 The combination of ISS' Internet Scanner vulnerability assessment solutions and Proventia's Virtual Patch technology, powered by X-Force security intelligence, make vulnerability management on the voice network easy to maintain. CONCLUSION Many companies are migrating to IP telephony without fully investigating or understanding the security risks involved. VoIP is subject to all the risks and vulnerabilities that affect Internet data networks. In addition, there are several VoIP-specific vulnerabilities related to VoIP protocols and specific components of VoIP technology. Since VoIP has a lower tolerance for service disruption or degradation than would be acceptable on a data network, careful security planning is essential for maintaining availability and quality on a VoIP network. Enterprises must put in place a VoIP security solution that preserves Quality of Service by protecting against service disruption and provides protection against attacks that exploit VoIP-specific flaws and vulnerabilities and attacks against supporting operating systems and devices. A multi-layered security solution that includes intrusion prevention and preemptive shielding of vulnerabilities is essential to keep the voice network secure. VoIP vendors and standards bodies have the opportunity to make telephone communication more secure than even traditional PSTN, however, security is traditionally not a priority when new emerging technology is being developed. Even as vendors make security improvements over time, it is important for an enterprise to implement a complete, multi-layered security solution from a VoIP-aware security vendor to ensure its combined voice and data network is fully protected. www.iss.net PREEMPTIVE SECURITY IS HERE INTERNET SECURITY THAT stops THREATS BEFORE impact Security Product Family Ahead of the threat. Contents. Specialty Answering Service. All rights reserved. Creating the Unified Multi-Service Demarcation Point Powered by AudioCodes Multi-Service Business Gateways (MSBG) The Challenge Enterprise organizations building their ICT infrastructure face many challenges. E-Guide Top Defense Strategies and Security Considerations for Unified Communications (UC) Organizations turn to unified communications as a cost-effective alternative to traditional communication systems.